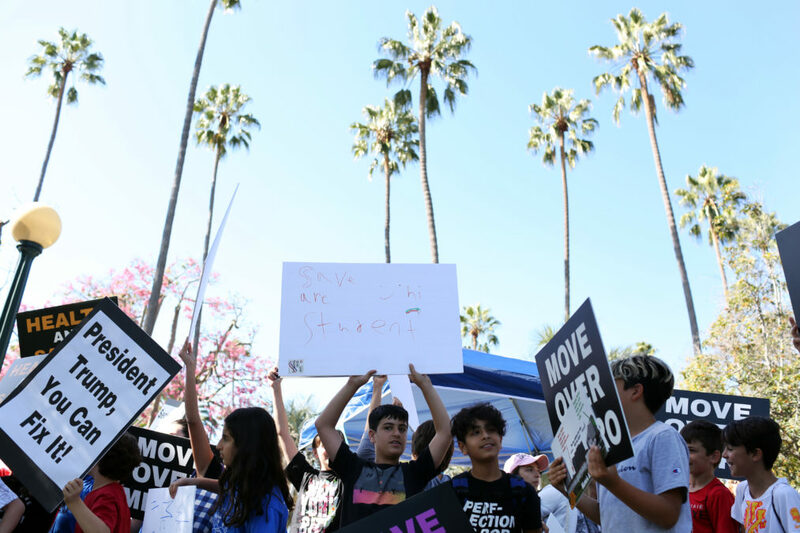 Students from the Beverly Hills Unified School District rally at Will Rogers Memorial Park in October to protest the extension of the Purple Line subway. Beverly Hills school officials say they lobbied the Trump administration – and the president himself – in an effort to stop a Los Angeles subway project that they say poses a threat to the local high school. But the Beverly Hills Unified School District claims it doesn’t possess a single document about the meetings. Calling that claim “highly implausible,” Reveal from The Center for Investigative Reporting has sued the school district, saying that it violated the California Public Records Act last year when it rejected a request for documents. The lawsuit, filed in Los Angeles Superior Court, says the school district should be ordered to do a proper search for the requested documents and release them promptly, as the law requires. “The public has an undeniably strong interest in knowing the use of public funds and the details of public officials’ lobbying efforts paid for by taxpayers,” the lawsuit says. No court date has been set. The fight against the subway line has dominated Beverly Hills politics for six years. It took on national importance when local power players began using their connections to President Donald Trump to try to kill the project by canceling $1.2 billion in federal transportation grants. The LA Metro transit agency is building a 9-mile, $8.2 billion subway extension to link downtown with the city’s Westside. The plan calls for running a subway line through a tunnel under Beverly Hills High School, a 92-year-old landmark famed for its movie-star alumni. Because the school was built atop an old oil field, the district contends that tunneling could set off explosions of underground methane gas and cause other dire problems. But LA Metro’s environmental studies show the project is safe. The school district has spent an estimated $16 million on lawsuits, but failed to stop the project. Several school officials have described their lobbying meetings. Last year, then-school board President Lisa Korbatov wrote in a private group chat that she had spoken with both President Trump and his daughter, presidential adviser Ivanka Trump, about the subway and had given them documents. Korbatov, a wealthy Republican donor whose board term ended in December, told anti-subway activists that she also had lobbied House Republican leader Kevin McCarthy. School Superintendent Michael Bregy said he, too, lobbied the administration, telling the Beverly Hills Courier weekly newspaper in 2017 that he and Korbatov had gone to Washington, D.C., to discuss the subway with U.S. Department of Transportation officials. So far, at least, the lobbying hasn’t gotten traction. Later, a Reveal reporter requested Bregy’s travel expense claims. The district provided credit card statements indicating Bregy had spent about $6,500 in school funds for trips to Washington, D.C., in 2017 and 2018. Bregy said the district doesn’t have documents explaining what school business he had conducted on the trips. As evidence that relevant documents are being withheld, the lawsuit cites a July 2018 letter to the head of the Federal Transit Administration by former Connecticut Sen. Joseph Lieberman, the district’s Washington lobbyist. The letter recaps the anti-subway arguments he had made at a recent meeting. Copies of Lieberman’s letter were sent to Bregy and Korbatov, but the district didn’t make it public. Reveal got a copy from the Federal Transit Administration. Reveal is represented in the lawsuit by general counsel D. Victoria Baranetsky, and Thomas R. Burke and Selina MacLaren of Davis Wright Tremaine.